Nurturing and nourishing for very dry hair. 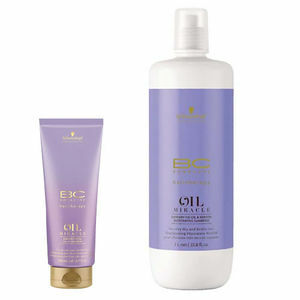 Schwarzkopf Professional BC Oil Miracle Barbary Fig Oil Oil-In Shampoo nurtures and nourishes your clients' hair, having been specially developed for very dry hair. It achieves this via its formula which contains cactus fig oil and microkeratin, which is distributed throughout the hairs. It renews the hair's resilience and leaves hair infused with a beautiful scent. Simply massage into wet hair to create a lather, rinse out and repeat if necessary. Comes in a 200-ml tube or 1000-ml bottle. £10.20 (inc. VAT) Why no VAT? We're a trade wholesaler and quote our prices without VAT to help our VAT-registered customers understand the true cost of a purchase.